The history of anarchism and syndicalism shows that the contrary is true. One of the crucial themes highlighted by recent works in this tradition is that the construction of a mass anarchist and syndicalist movement based on anarchist principles of anti-authoritarianism, equality, freedom, liberty, justice, and democracy is possible – and is something of which ordinary working class and poor people are perfectly capable. This is wonderfully demonstrated by the anarcho-syndicalist CNT (the National Confederation of Labour) of Spain. It was formed in 1910 in Barcelona, in the Catalonia province of Spain – the country’s industrial hub. 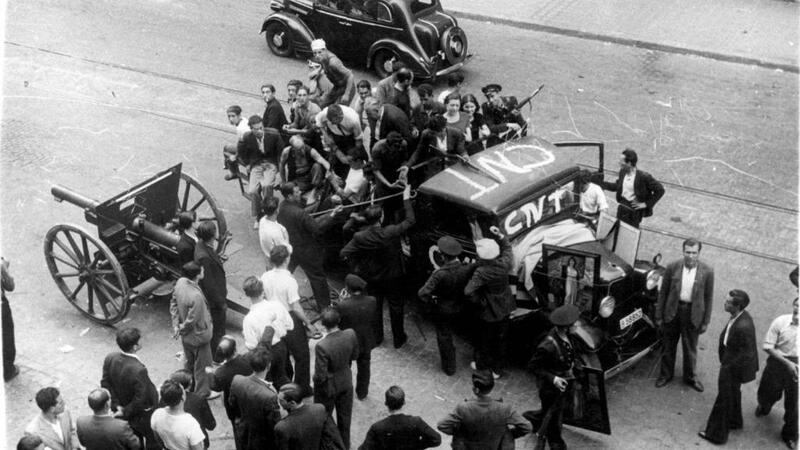 The CNT emerged out of difficult social, political and economic conditions that characterised Spain, and grew, despite severe repression, into the 1930s. Embodying the central anarchist principles of individual freedom, cooperation, and democracy, the CNT became the most powerful union – and mass – movement in the country. Spain was marked by high level of inequality, and a social system that favored the elite; a rightwing Church often operated as an institution of oppression, as did the state. The activities by the CNT were heavily repressed through armed force. State power was continually used to smash working class and peasant resistance; this was essential for the ruling class to maintain their privileges. Despite these conditions – and in contradistinction to the notion that repression, authority, exploitation, crippling poverty, hunger and misery, as well as wealth and power for people numbering no more than the fingers on one hand, are necessary evils – the CNT provided a practical example of ordinary human beings possessing profound capacities and intelligence. It built a mass union movement that defended and advanced workers’ conditions, that educated millions of people in an alternative worldview, that worked alongside communities against evictions and for lower rents, and that allied with working class, the peasant youth and women fighting for the anarchist cause. Through its structures, its militancy, its education and its alliances, the CNT helped develop and nurture, on a mass scale, the capacities and innate intelligence of the masses – capacities and intelligence that nullified the need for mastery of the many by an elite. This was demonstrated most dramatically in the 1930s, when the CNT (and the allied Anarchist Federation of Iberia, the FAI, an anarchist political organization linked to it) launched or supported a series of popular rebellions. In 1936, the CNT and FAI helped stop a military coup, unleashing a massive and profound social revolution that saw millions of hectares of land, and vast parts of industry and services placed under worker and community control. Often governed through CNT structures, the “collectives” were self-managed, highly efficient, and rejected the logic of production for profit; they moved towards the implementation of the maximum programme of anarchist communism. Unfortunately, failures by the CNT and FAI stalled this programme, and opened the door to its defeat. That said, the CNT’s experience from the 1910s to the 1930s highlights the reality that we are, at this current conjuncture, in fact settling for far less than human beings are capable of creating. It is in the hands of ordinary people to remake the world. This should be remembered in movement building: the CNT model that, following in the footsteps of anarchist luminary Mikhail Bakunin, insisted crisply that “Future social organization must be made solely from the bottom upwards, by the free association or federation of workers,” first local, then finally, “in a great federation, international and universal,” embracing all suffering humanity, and capable of re-making the world into one based on social justice, equality and freedom.